Pathein is rather a nice town. The Lonely Planet doesn't give it much airspace, describing it merely as in the middle of a fertile rice-growing area, as a stop on the way to nearby beaches, and at the centre of the country's parasol production. Since I'm as interested in parasols as most people, which is not much, that wasn't exactly an endorsement. So with four days to spare before the arrival of Emma and Ben, we headed west from Yangon to Pathein, and were very glad we did. The town is blissfully untouristy - we saw four other Caucasians in our time there - and it's a great, chaotic, laid-back place in a Burmese sort of way. 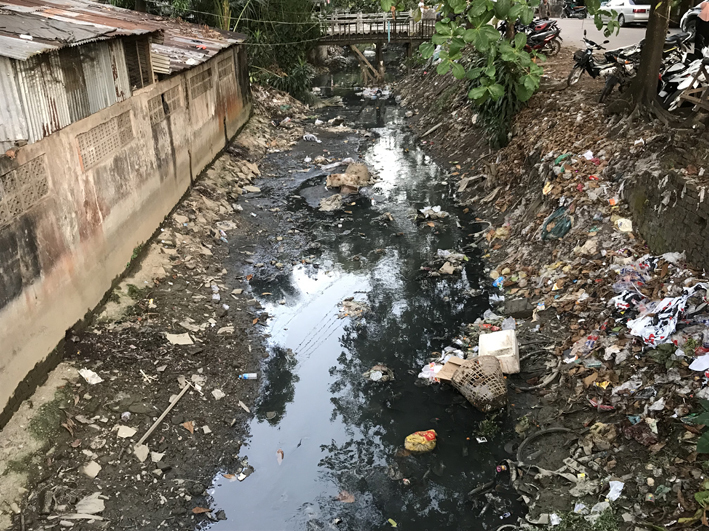 That is: really friendly people; horribly polluted canals; a mixture of dilapidated wooden houses, blackened colonial buildings and modern concrete with twiddly ironwork; and many seriously unostentatious eateries offering a mix of Myanmar, Chinese, and Indian food. Quick digression... Restaurants here almost always open directly onto the pavement (ie without a door), have concrete floors, fluorescent lighting, grubby walls and floors, a toilet roll in a plastic holder on the table to use as a napkin and cheap plastic chairs. 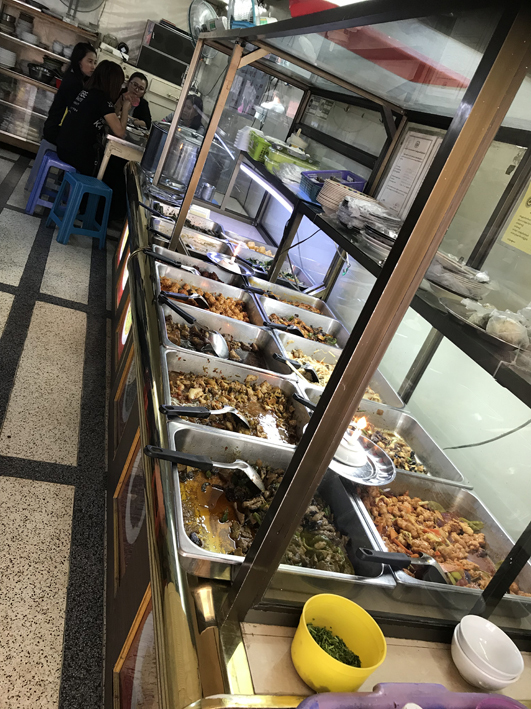 "Myanmar food" basically involves a (normally delicious, though not always delicious-looking) selection of pre-cooked curry dishes - pork, chicken, duck, fish, intestines - laid out in metal serving dishes. You point to the dishes you want and eat them with rice and condiments. A curry buffet, I suppose. This curry shop is in Yangon and rather a smart affair. Very often they are just a stall by the side of the road. We were advised it's better to eat at a curry shop at lunchtime, rather than the evening, as the food's likely to be fresher. Back to Pathein. It also has more cycle rickshaws than we've seen elsewhere, a similar quotient of motorbike taxis and tuk tuk trucks touting for business on every corner and a night market down by the river, a rather high-class affair by Myanmar's admittedly fairly chaotic and rubbish-infested standards. It's not a great photo, but if you look carefully, you'll see this amazing woman is balancing her tray of fried things on her head in a cycle rickshaw. Quite a feat, even without the seriously potholed roads. 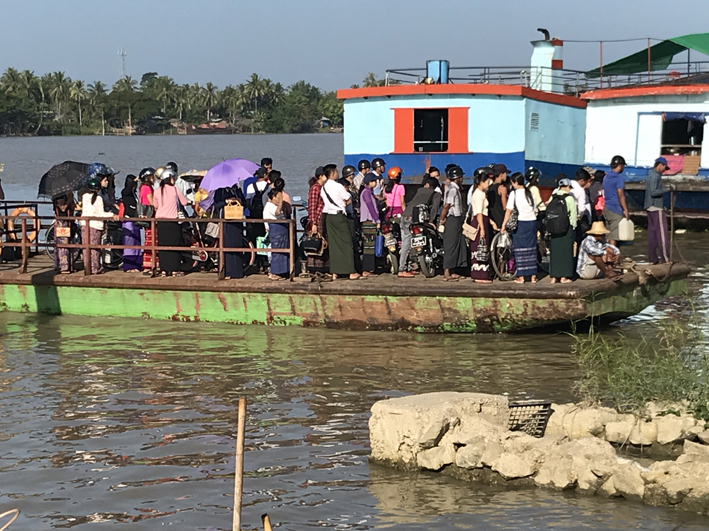 One of the Lonely Planet's criteria for accepting or rejecting hotels in Myanmar is the absence or presence of squashed blood-soaked mosquitoes on the walls, and the size and joyousness of the bathrooms. In my experience you have to go fairly high up the price scale in Myanmar to lose the mosquitoes and gain a pristine bathroom. Certainly the Day-To-Day Motel (which isn't a motel at all, (hardly anyone has cars, and even if they did, they wouldn't be able to park them outside the third-floor rooms) is what my grandmother might have called cheap and cheerful. Sometimes I think we ought to be too old for budget accommodation, but it does make the dollars go further and at least the place wasn't still being built - as the one we booked (and stayed in) in Bagan was. We spent one day in Pathein on a wonderful boat tour of the delta (of which more in a separate blog), and the rest of the time wandering around aimlessly, visiting pagodas when we came across them (which is often in Myanmar), trying (or sometimes not trying) local delicacies, watching small and smaller ferries plying endlessly across from villages on the other side of the river, visiting the night market, being befriended by a mum and four kids who begged at the market, and taking pictures of things that made you want to take a picture. Like these chickens, on their way from the river to the market. I was writing this blog sitting on the bus back to Yangon, with a seriously slapstick Burmese movie playing on the overhead screen. (Almost all long-distance bus trips show a movie - normally a mixture of slapstick comedy (farmers falling into wells and tripping over while drunk), and dead-serious tear-jerker romance, with lots of ranting and wailing. And I realised, with much shame, that we didn't visit at a single parasol establishment. We also didn't eat any intestines or other innards at the night market. So many missed opportunities!